I don't always love long runs. But lately, they've been making me happy. This week, I did my long run today instead of on Saturday, as usual. With my girls out of school for spring break, it just worked out better with our "staycation" plans. I couldn't have asked for better weather. And in spite of running the past three days, my legs felt really good. I remembered to take my anti-nausea pill, I only drank water, and I took my electrolyte tablets every 45 minutes. I feel like I've finally figured out what works for me, and I'm sticking with it. A little inspiration from my awesome runnerd friend Julia (in the form of the perfect text) also helped get me through the miles. My runner friends are always so inspiring and encouraging when I'm tackling a long or tough run! I am so blessed to have them in my life. The run wasn't easy. I'm not sure running 20 miles ever will be (at least for me). But I felt amazing afterward, my legs still aren't sore at the end of the day, and I am already looking forward to my 22 miler in a few weeks. So run long and strong my friends. I enjoy long runs even though they often beat me up. You did great! wow you destroyed that run! Not sure if you are doing a marathon soon, but I guarantee you will set a PR. Way to go! I love the long slow run...it feels so good! Awesome! Long runs are so great once you bet past the first few miles. 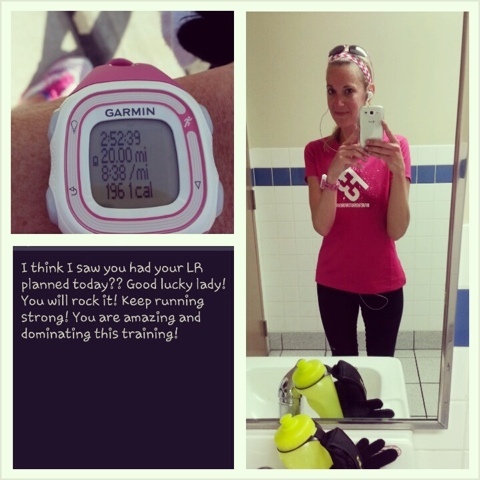 You're making me want to train long distance again!